Asus wants to poach in the starter sector of multimedia notebooks with glossy piano lacquer, a snazzy design and a switchable graphic solution. Or don't they? Is the 15.6 inch notebook UX50V more an office device that looks good but is barely suitable for multimedia due to the weak hardware? 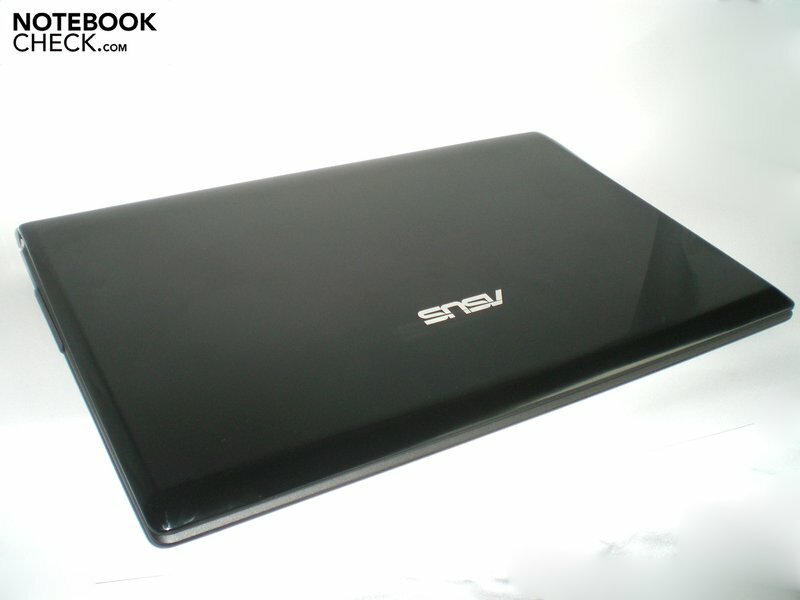 We released the designer laptop on our test course and made our verdict without being blinded by its looks. 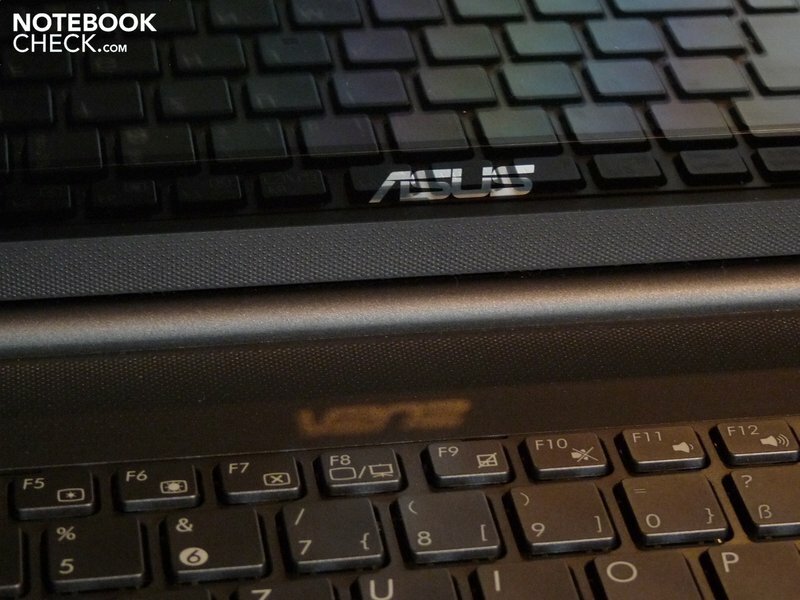 You have to confess that the Asus designers have a very good taste, as the UX50V's exteriors have been well-designed. But the inner values also count and an energy saving Intel Core 2 Solo U3500 with 1.44 GHz and a dedicated NVidia Geforce G105M with 512 MB RAM has been built into our prototype at hand. 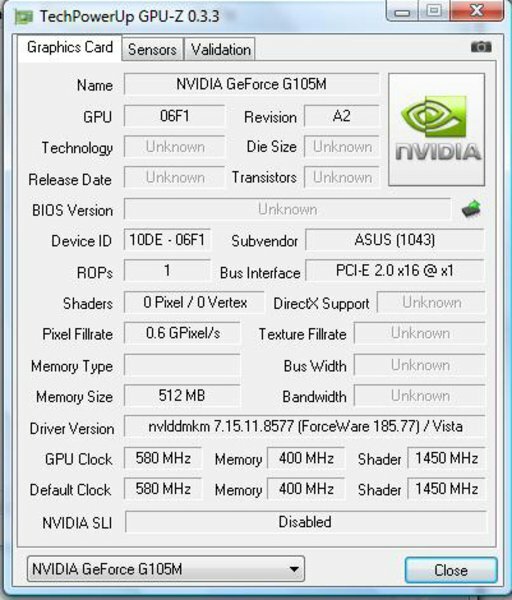 The graphic card can even be switched by a push of a button to save energy, in order to fall back on Intel's GMA 4500M HD built into the chip set. There isn't any information to be found on Asus' German website, although the device is already available in this country at a few retailers. The manufacturer offers five different models in other European countries, which mainly differ in their processors: Our test configuration with a Core 2 Solo U3500 should be in the center span of the efficiency bandwidth. There are, for instance, two models with either a Core 2 Duo SU 9400 with 1.4 GHz or a SU9600 with 1.6 GHz clock rate available in the United Kingdom. Both processor models have two computing cores. Downwards, there is a Core 2 Solo SU 3300 with 1.2 GHz and a Pentium SU 2700 with 1.3 GHz clock rate finishing the range of processors. Seeing that our notebook had problems under Windows Vista and several open applications, we'd like to disadvise from the smaller single-core processors in advance. The model tested by us is available in the internet starting at 850 Euros. According to Asus, there aren't any further configurations for the UX50V planned for Germany. If something changes in view of this, we will naturally inform you. The design is felicitous into the smallest detail. 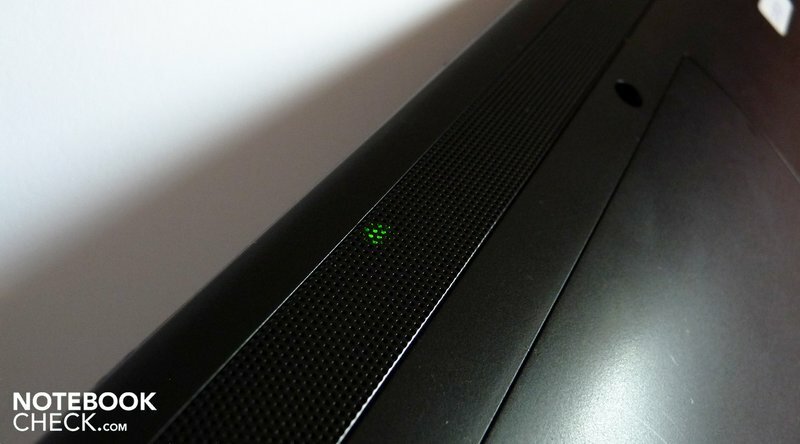 The UX50V's case makes a stable and high-end impression. Most parts have been made of high-quality plastic, with exception of the loudspeakers that have been manufactured in metal. The case has a breadth of 385 millimeters, a depth of 257 millimeters and a height of 29 to 33 millimeters and weighs 2630 grams. The adapter, with a maximum of 65 watt consumption, weighs an additional 290 grams. 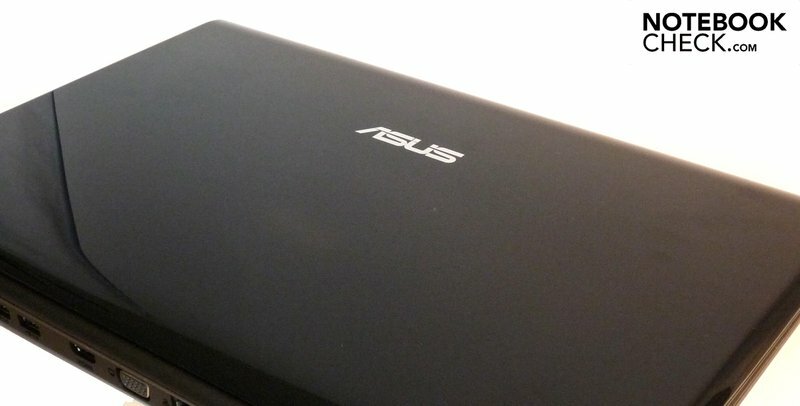 As already mentioned, Asus has done good job on the design: A shiny black coated lid with a silver Asus logo stamped on it flashes at you when you open the package. Under the beveled front edge, a metal grill runs over the whole breadth, behind which the loudspeakers have been concealed. 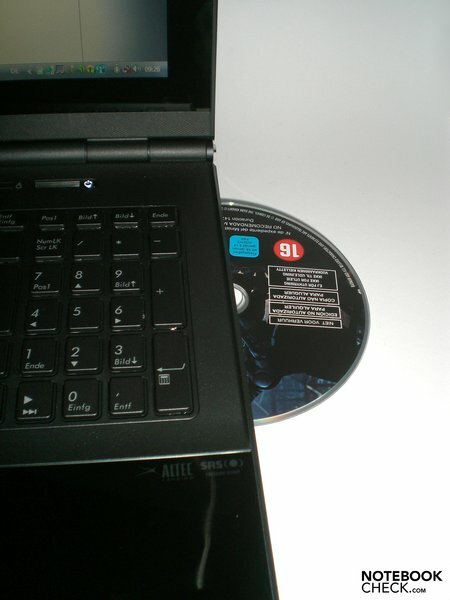 Silver buttons for ejecting the DVD and for the WLAN are found on case's right, respectively left side. The sides of the hinges, that pull themselves frontward with an elegant sway, have also been framed in silver. You are greeted by numerous reflections when the notebook is opened, as Asus also builds in high-gloss surfaces here: The screen surface seamlessly blends into the frame and even the wrist rests and touchpad gleam. 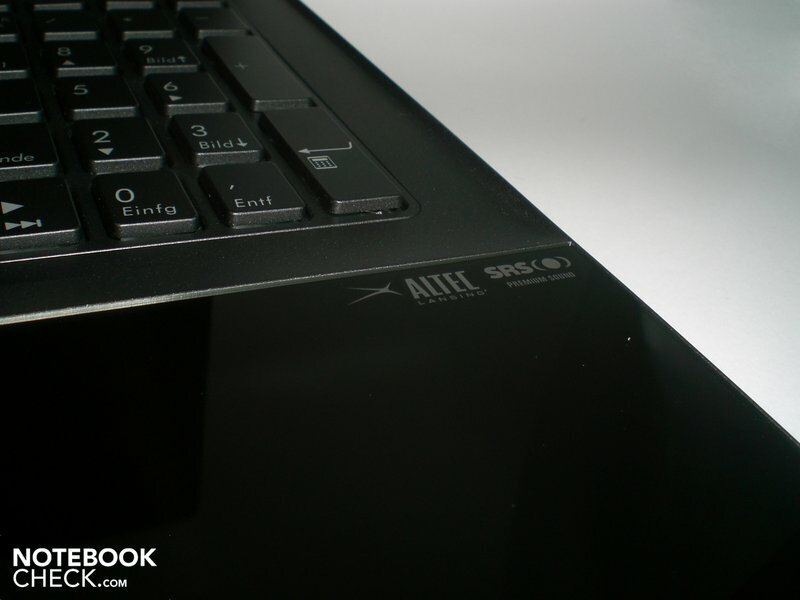 Asus allows merely the bottom and the keyboard bezel to be manufactured in matt plastic. The plastic over the keyboard is slightly structured towards the display. All of this has quite a pleasant feel - starting with the smooth piano finish over the knobby structure up to the keyboard, the fingers can take much delight - maybe too much sometimes. 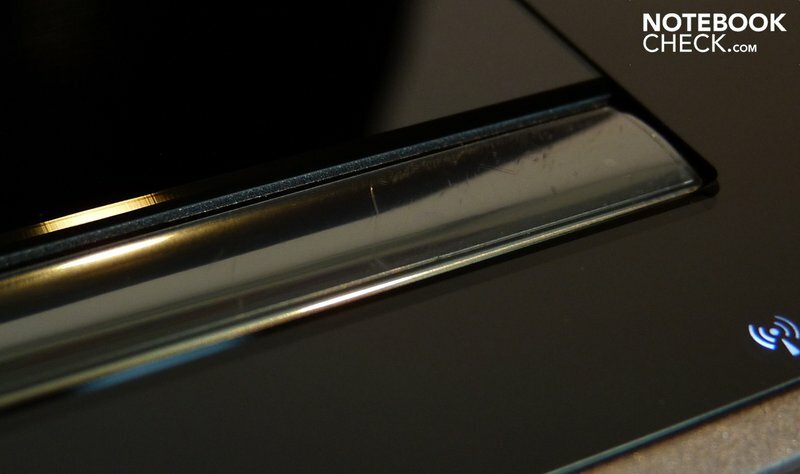 The biggest problem of the Asus UX50V's design is its susceptibility for fingerprints, grime and unfortunately also scratches. 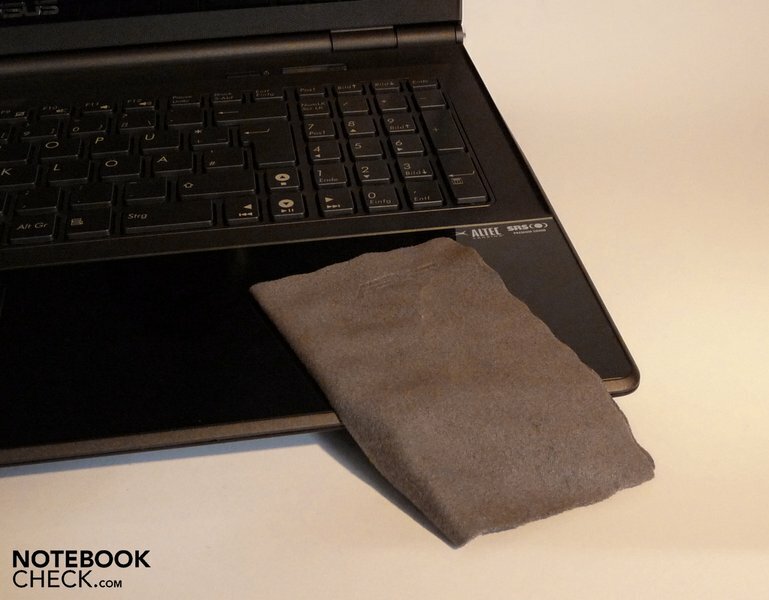 In any case, Asus hasn't completely ignored this problem and adds a microfiber cloth and a little care instruction guide, with which the notebook can be freed well from potential fingerprints. No matter if lacquered or not, all components sit tight in the case. Nothing clatters or creaks when picking it up. 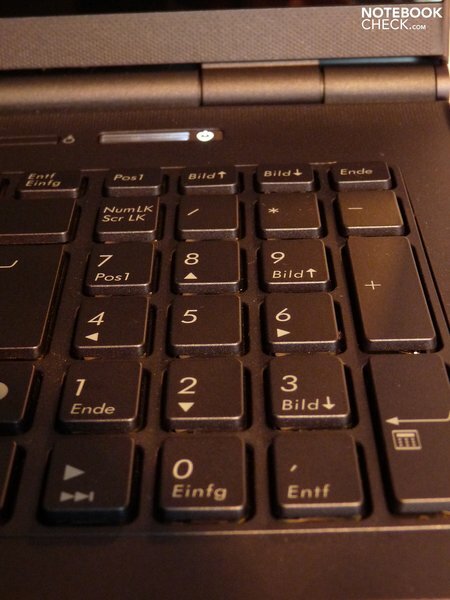 However, the keyboard flexes strongly just around the enter key and the screen can be twisted. But you have to purposely apply medium pressure on the display's left and right, which will probably barely ever happen under normal circumstances. 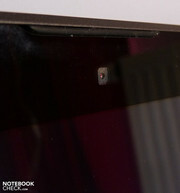 The two narrow hinges can't completely prevent the screen teetering, but it's been fixated tightly otherwise. The display closes automatically at ten centimeters. A closure hasn't been built-in; merely the hinges keep the lid in a closed state. It's possible to open it single-handedly due to its heavy sub tray. 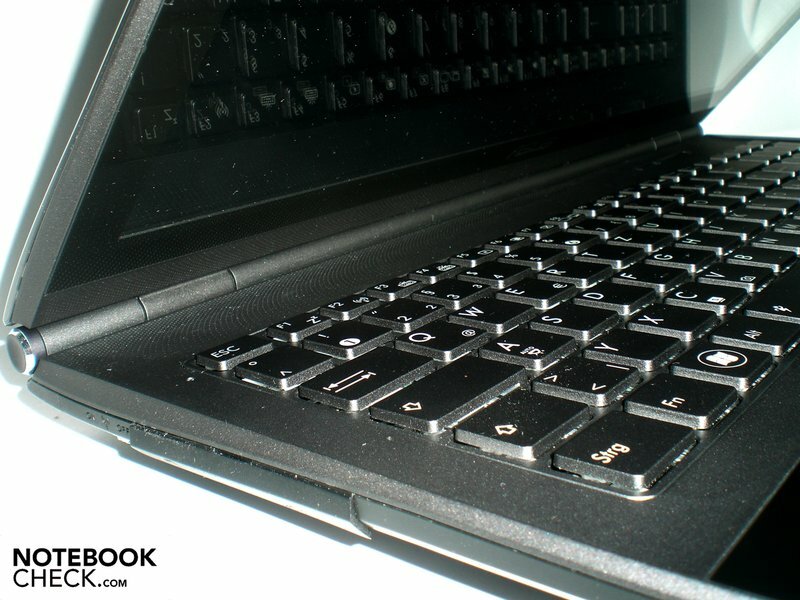 The hinge construction prevents the laptop from being opened any further than 45 degrees towards the back. There has to be a bit of care taken when the display is tilted towards the front: Already after an angle of around 40 degrees, the display turns itself off and triggers the properties which have been set for "close monitor" in the energy savings options. This is standby in the standard settings. 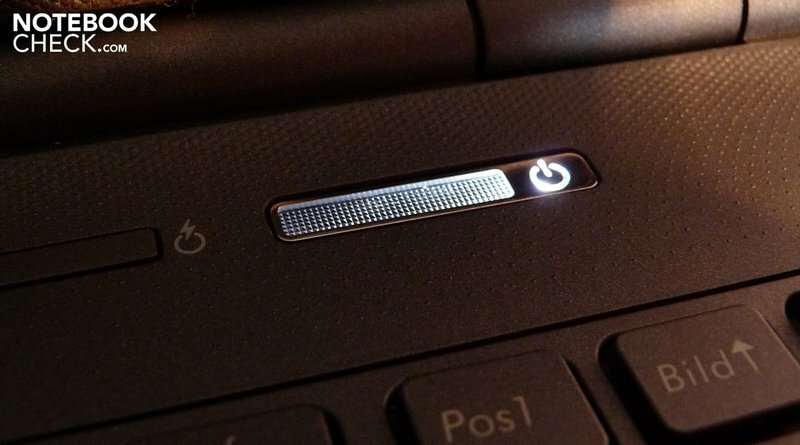 The status lights, power button and keyboard light up in white when the device is turned on. This fits well to the rest of the design and is a welcome change to the "persistent blue" of other manufacturers. 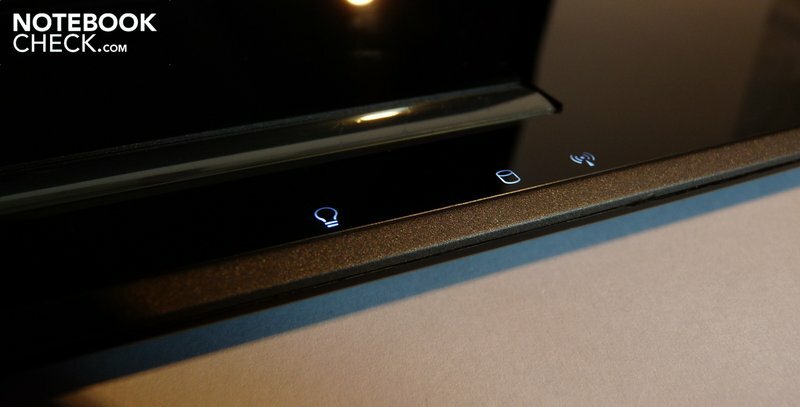 However the LED that illuminates the power button is quite bright and has been placed directly under the display. The user could be blinded by the LED when looking at the screen from an unfavorable sitting position. Asus has unusually gathered almost all connections on the case's rear. There is merely a slot-in DVD burner with Lightscribe support on the right. Special blanks can be provided with a label on the upper side. On the left, behind a small flap, there are two connections hidden after all: An 8-in-1 cardreader, which supports SD, MMC, Mini-SD, XD, Memory Stick, MS Pro, MS Duo and MS Pro Duo cards, and an USB 2.0 port. Following this, there is a silver hardware switch for activating and deactivating the wireless module for WLAN and Bluetooth. On the back, there is from right to left, first the fan grill, then the power socket, a LAN port, a VGA connection, a HDMI port, two USB 2.0 ports, as well as a 3.5mm microphone-in and a 3.5mm headphone-out. Because the louver is on the rear, you also can't always see if it's being blocked by something. This also seems to be not quite optimal to us. The battery, which can't be seen from above or from the sides and needs a fairly large area for a 4 cell battery, is found on the bottom. However, it is also extremely flat with only 7.5 millimeters. Almost all connections are placed on the rear. Aside from the 32 bit operating system, Windows Vista Home Premium, Asus also preinstalls their ExpressGate that can be started with a hot key. This application bids functions like a web browser, picture gallery, media player, DVD rendering and Skype telephony, without having to start Windows. For the main operating system, Vista, there is an upgrade card for Windows 7 included, as well as a recovery CD and a CD with drivers and utilities. Of course, Asus has attached a package of its own applications: With Lifeframe, the built-in webcam can be used over the monitor to record videos or take pictures and to edit them with various funny effects. The system's start display can be adapted to individual needs with Fancy Start; Data Security Manager takes care of sensitive data and the AI Recovery Burner creates a system recovery CD. As the loudspeakers are SRS certified, there is also a program called SRS Premium Sound included, with which sound settings can be improved. 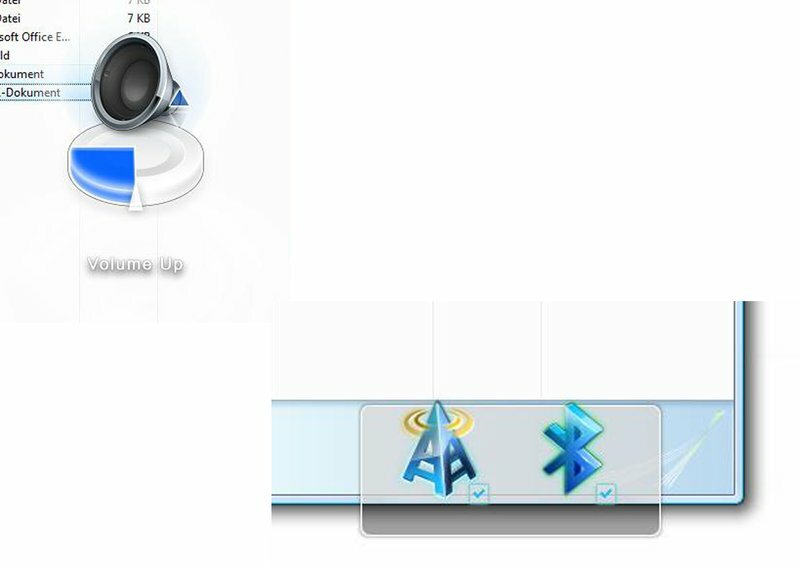 Additionally, the Cyberlink Power2Go suite is installed, which contains the burning program and the DVD player. Microsoft Office and Norton Internet Security test versions are also preinstalled. There's not much more in the package, aside from the already mentioned microfiber cloth for cleaning the shiny surfaces. 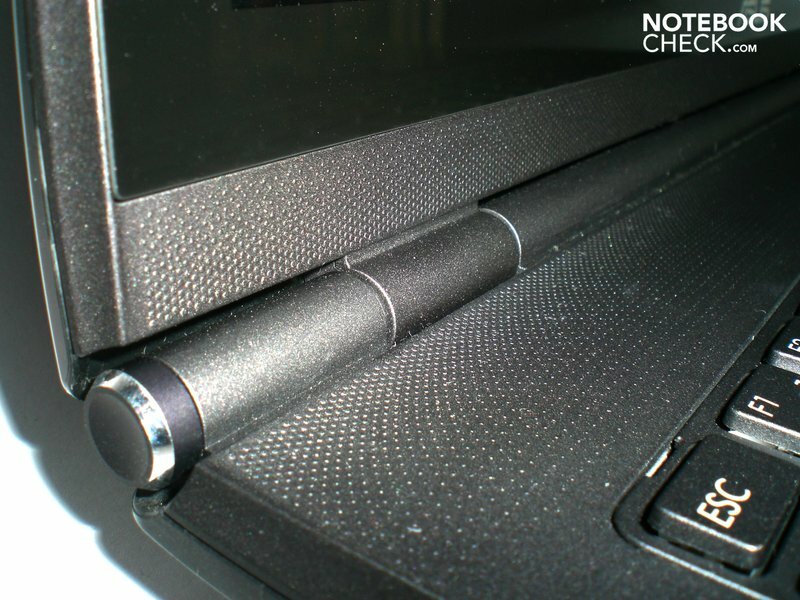 Asus has only also added a Velcro cable tie for depositing the adapter without problems in a notebook case. 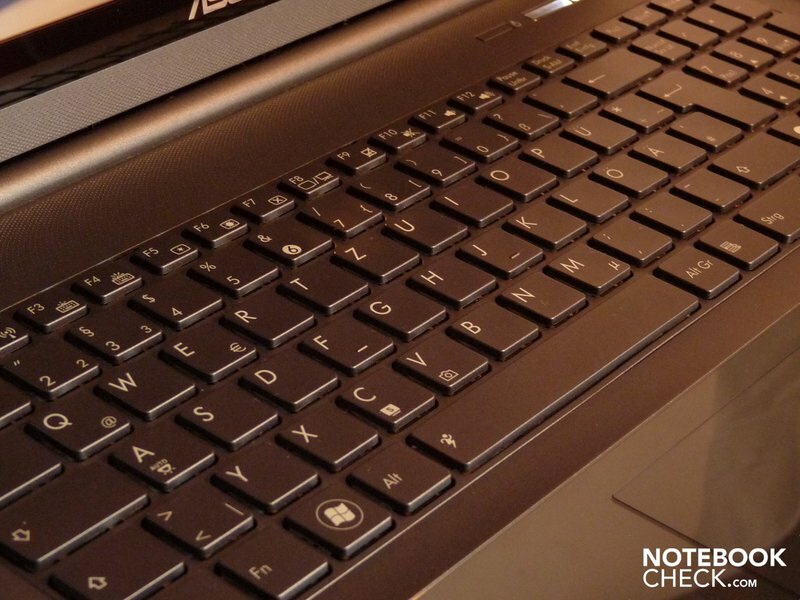 Asus uses a chiclet keyboard with single-keys and fairly large spaces between them, as it is built into many devices currently. In the meantime, the numerical block has also become standard and it joins on the right and has narrower keys than the main keyboard. 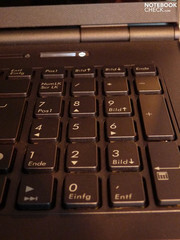 Typing on the keys is very pleasant as they don't have a deep stroke but are pleasantly quiet and have a good feedback. However, that the keyboard flexes greatly especially in the area of the enter key at already low pressure is disagreeable. 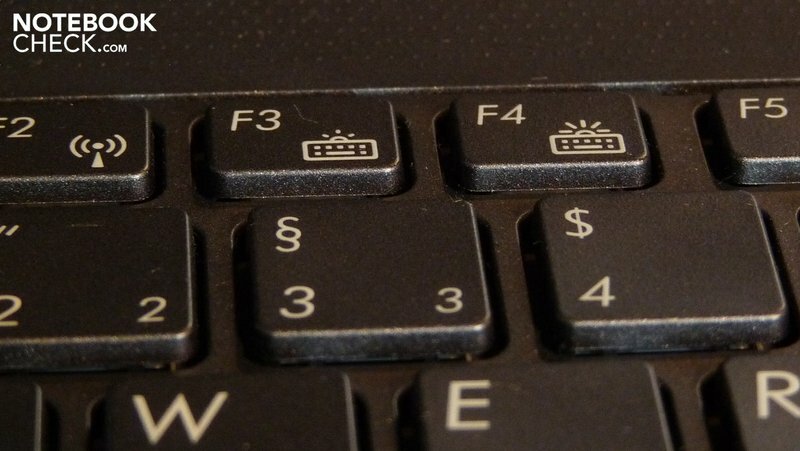 The keyboard light, that is kept in white like the status LEDs and the power button light, is worth mentioning. It allows for pleasant working even in adverse light conditions and can be dimmed in several stages or even deactivated via a key combination. 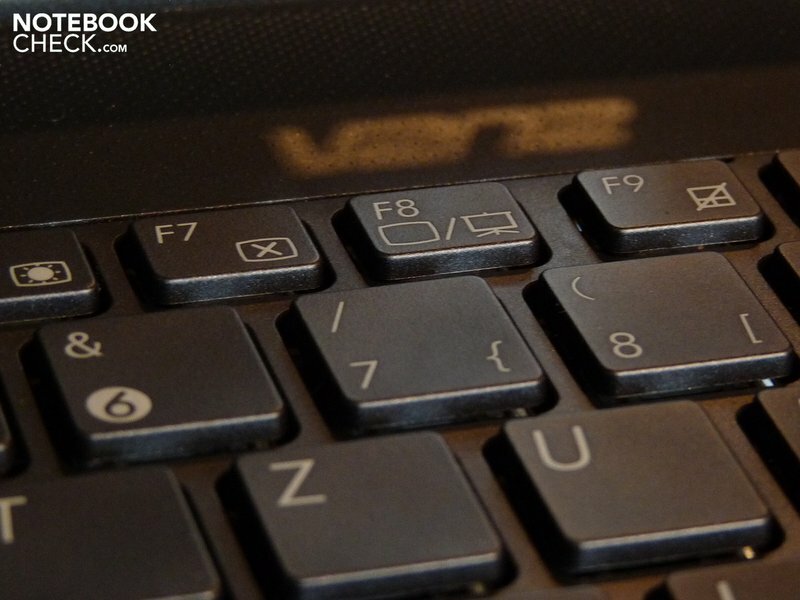 Alternately, you can activate the brightness sensor with the key combination "Fn + A", which is beside the keyboard and adjusts screen brightness and keyboard light in relation to the surrounding light. 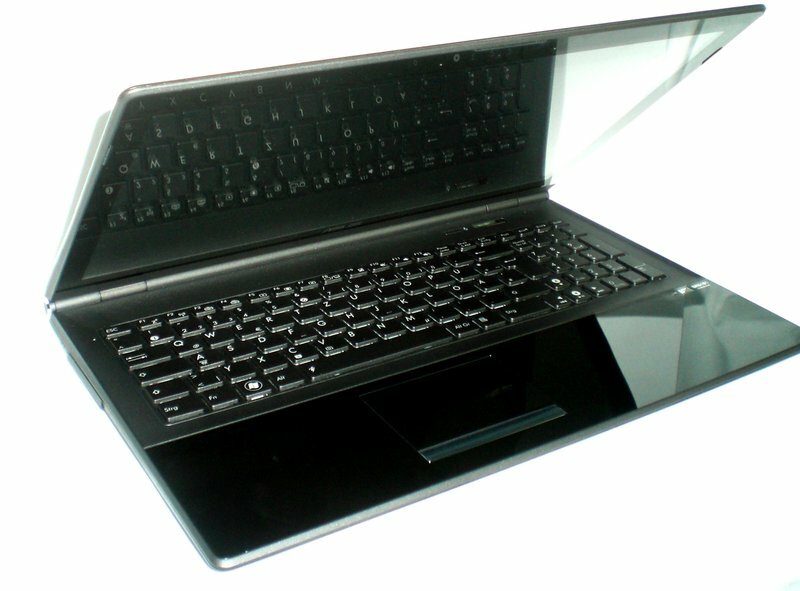 The touchpad is, alike the surrounding wrist rest, in high-gloss that looks attractive but is very susceptible for grime. 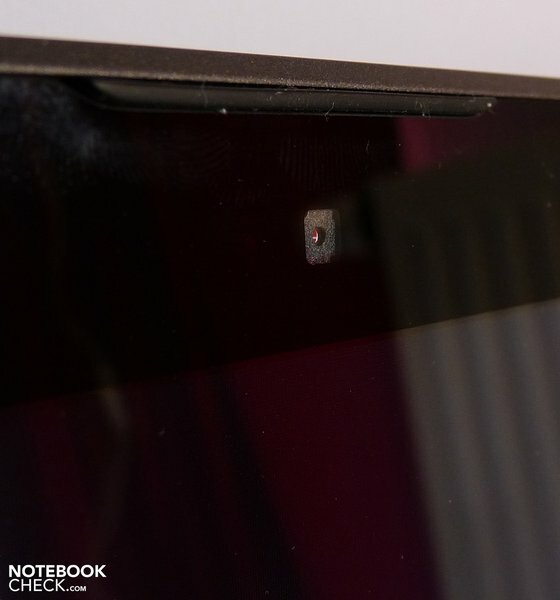 Apart from that, the surface's gliding traits aren't good: The finger literally sticks partly to the touchpad. The touchpad doesn't support gesture commands. However, there is a scroll function implemented on the right, which is neither marked nor raised and therefore is triggered unintentionally sometimes. At least, the touchpad is clearly separated from the rest of the wrist rest both optically and haptically by a small edge. 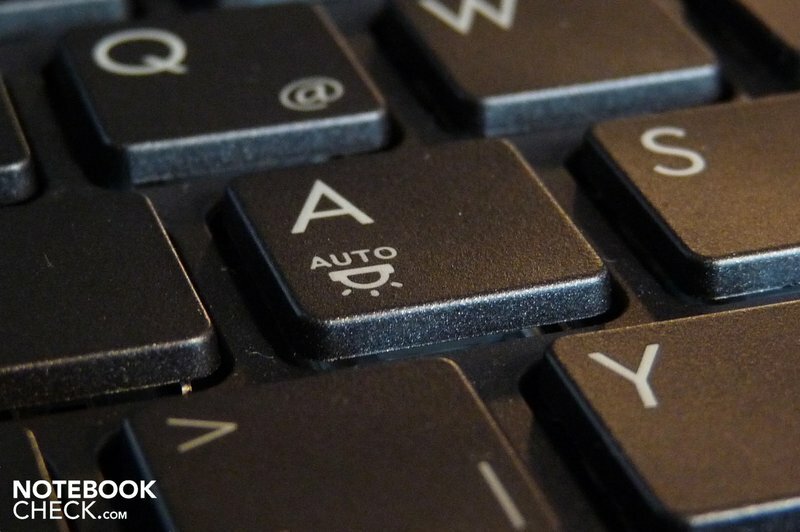 The touchpad keys are actually only one single key that is triggered either left or right for the correlating mouse click. Then again, the keys look nice because of the chrome exterior and the engraved lettering and don't give any reason to complain in view of functionality: The keys might just provide a bit too little click feedback, but otherwise there's nothing to object to. 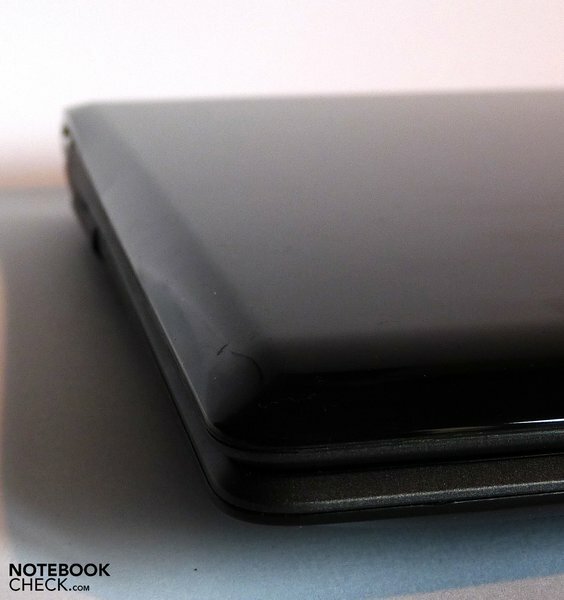 The display's surface is almost just as glossy as the notebook's entire rest. 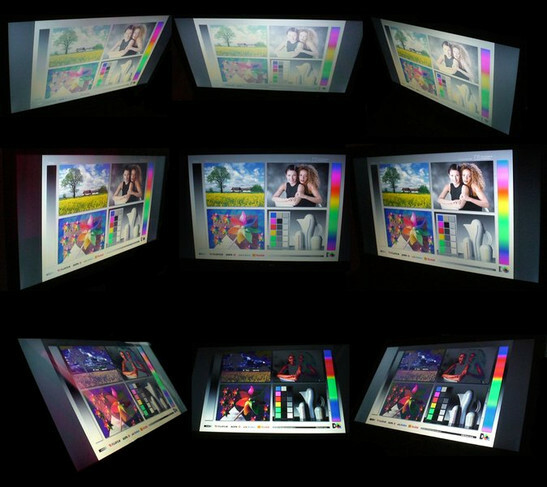 Behind it, there is a 15.6 inch screen with an LED backlight and a resolution of 1366x768 pixels. Asus names the screen "Color-Shine", which probably is supposed to imply that the glossy surface makes the colors look vibrant. The notebook is only suitable for outdoor use or on the desk at the window to an extent, due to its shiny display surface. In addition, the average brightness of 151 cd/m2 turns out to be very meager. The display was especially dark in the lower left corner with 109.2 cd/m2. The illumination of 59% is also everything but homogenous and the contrast of 161:1 is alright but by far not a top value. The colors look vivid, subjectively, but a vibrant black looks different than that what the Asus display showed us: It was rather more a dark gray. In return, the uneven illumination is especially striking when, for instance, a completely white desktop background surface is used. There is then a gray film to be seen in the lower left. The white radiates highest in the upper right. This correlates to the lab's test values that show the highest brightness of 184.6 cd/m2 is in the upper right corner. Therefore, those who would like to use their notebook outdoors should consider that reflections and low brightness aren't a good combination for outdoor missions before buying. The horizontal viewing angles are, in opposition, okay and permit several people to, for instance, watch a movie on the UX50V. As to display's vertical viewing angles, there's no reason for complaint either, because the image can be recognized for a long time both from above as well as below. The screen's viewing angles are okay. A most interesting topic for us was, if the Asus UX50V couldn't only score with its looks, but also with its performance. The configuration of our prototype didn't promise much at first. 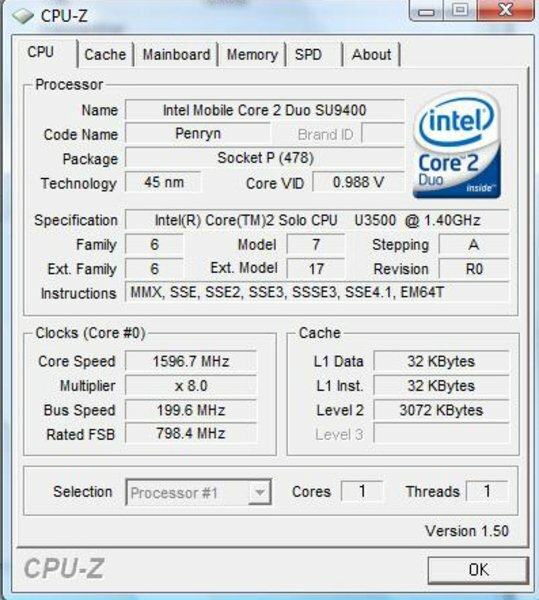 The Intel Core 2 Solo U 3500 processor with 1.4 GHz is satisfied with a power consumption of 5 watts, but has a generous 3 MB level 2 and level 3 cache in total and bids a fast 800 MHz frontsidebus rate. However, it hasn't got the power of a second computing core that is supported by many applications nowadays and so the CPU has problems in coping with several tasks at the same time (multitasking). If you want to, for instance, watch a HD video from the hard disk and look something up quickly in the internet, it can happen that the video is sometimes unsmooth. The HD video in energy savings mode alone is enough to make the processor work up a good sweat. The objective test results also confirm the first impression: 1153 points in Cinebench and 2497 points in PCMark05 isn't an especially strong performance. Those who want to save energy can switch to the graphic chip, GMA4500MHD, integrated into the chip set that need less power but also less 3D Performance. We executed our following 3D benchmarks with the dedicated graphic card. The 3DMark results correlate to the expected values, however they are rather at the lower edge of the average values. The system even achieved the lowest ever measured value for this graphic card with 3243 points in 3DMark05. This is also probably due to the fairly weak processor. The notebook has enough system memory in any case. 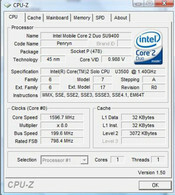 Asus has built 4 GBytes DDR2 800 MHz RAM in our prototype. But merely about 3 GBytes of the 4 GBytes can be used effectively because a 32 Bit operating system has been employed. The hard disk does its job properly. The Seagate Momentus with a capacity of 500GB memory and 5.400 revolutions per minute makes a good impression with an average data throughput rate of 50.5 GBytes. Then again, the quite high processor load of 11% points to the weak CPU. LG provides the DVD RAM drive, G S20N, that has been built into our prototype. This is a slot-in device that reads and writes DVD with up to an 8-fold velocity. Intel's Wireless WiFi Link 5100 is used for the WLAN module, which already supports the newest WLAN standard 802.11n in addition to 802.11 a/b/g. Apart from that, a Bluetooth 2.1 module has been integrated. 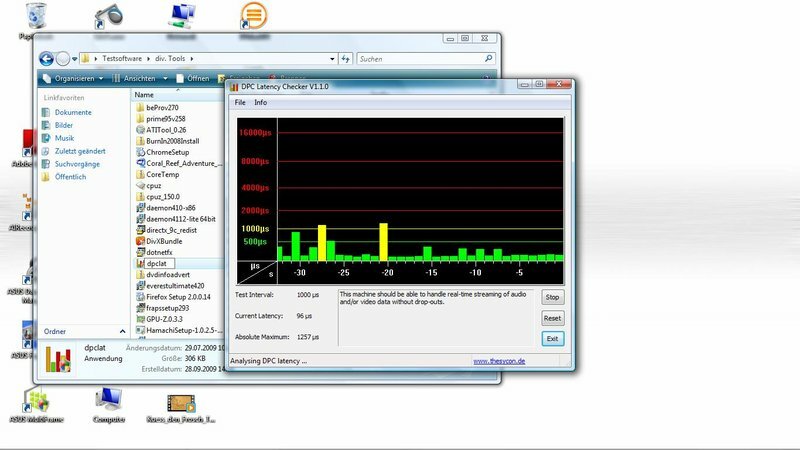 Finally, we checked the latencies under Windows Vista with the DPC Latency Checker tool. 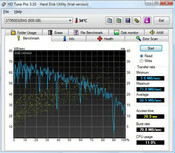 High latencies can lead to problems with connected devices, such as external sound cards. All values were within a limit so that the UX50V shouldn't have any problems with external devices. No one will be expecting a gaming bolide in view of the configuration, but it does become obvious that state-of-the-art processors with only one computing core already weaken in application performance. The results would have probably turned out better with an equally clocked dual-core processor. It should also be mentioned that the preinstalled Windows Vista Home Premium should be updated as soon as possible because the fairly small processor had vast problems under the unpatched Windows Vista version, processed very slowly and the system sometimes even froze completely. It could be worked with reasonably after a few operating system updates. The energy saving processor turns to account, as the fan barely has any work and stays pleasantly in the background: An average of 34.3 dB(A) in standby is a good value. Probably also because the fan has been placed at the rear, it sometimes seems that there isn't any fan noise existing at all. The maximum of 40.3 dB(A) under load isn't really a high value. Additionally, it's also diminished by the fan's position because the entire screen is between the ears and the fan grill. 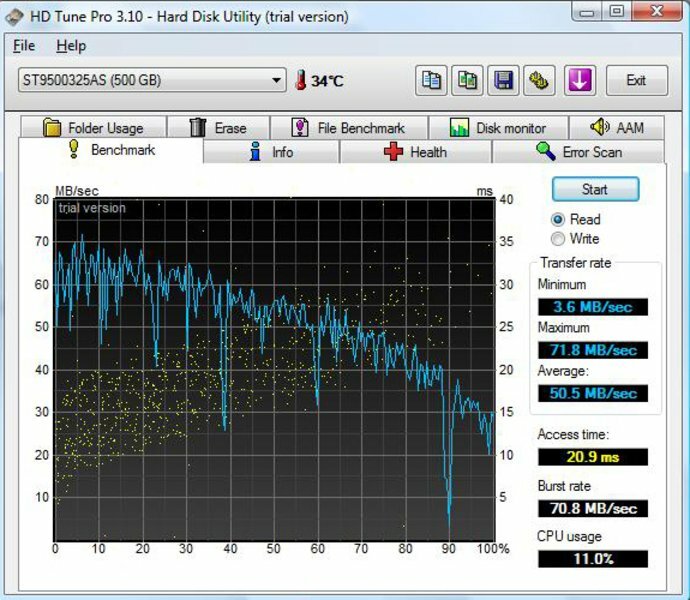 The hard disk also keeps itself pleasantly in the background with 32.1 dB(A) and the DVD drive isn't obtrusive during use with 36.4 dB(A) either. However, you do need to get used to the noise of the slot-in drive at its start and at the data carrier input: The mechanism that brings the DVD or CD in position, or rather ejects it, is fairly loud. The temperature also benefits from the energy saving components. We reached a maximum of 38.1 degrees Celsius in the center above the keyboard in the stress test. Actually, an unusual place for the highest temperature. However, if you consider that the fan's grill is underneath this on the rear and the processor has probably been placed in this area, it's then plausible. We reached a maximum of 42.1 degrees Celsius on the device's bottom under load. The maximum temperature at standby was even only 32.6 degrees Celsius in the case's center bottom. 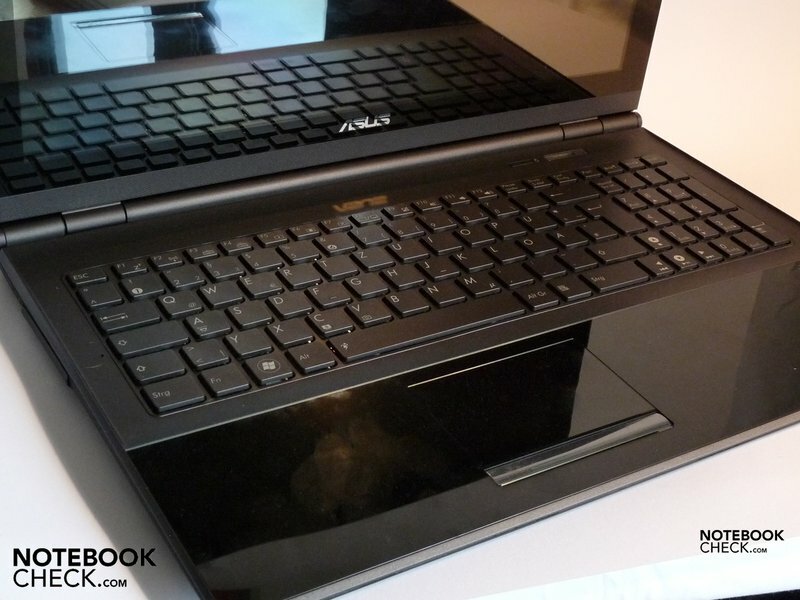 All in all, the notebook with its low temperatures is also recommendable for people who would like to use the UX50V on their lap in office mode. It shouldn't heat up disagreeably here because the notebook is only suitable for demanding games or 3D application to a very limited extent, anyway. The adapter could be picked up without hesitation after a longer period of use, too. We established a maximum temperature of 47.6 degrees. 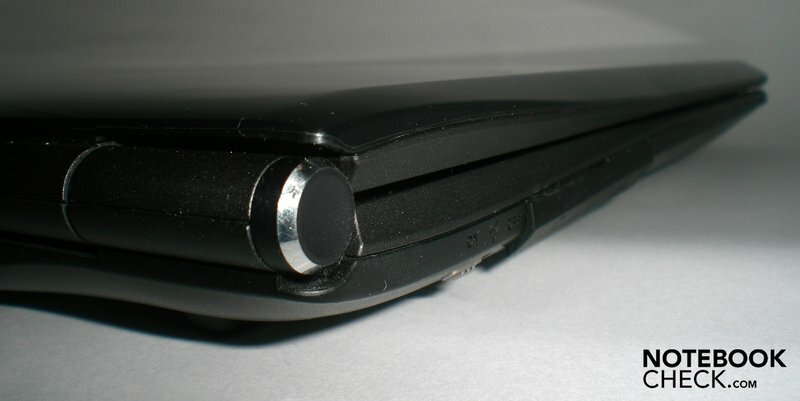 The loudspeakers have been placed a bit awkwardly under the wrist rest's front edge. 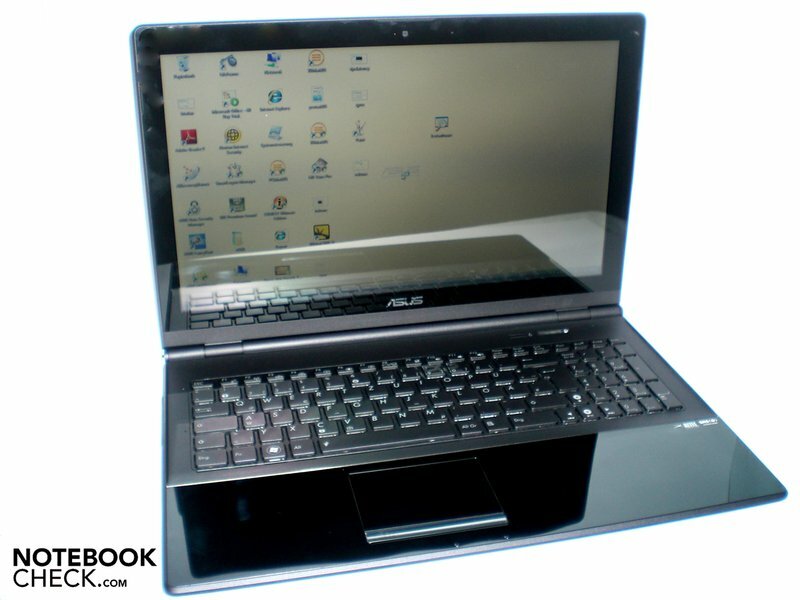 Hence they radiate their sound more towards the surface than towards the notebook user. If the surface is then also soft, it could happen that the sound is considerably muffled. This would be a real pity, as both loudspeakers from Altec Lansing hidden under a metal grill do a really good job. The trebles don't fray, speech is well understandable, and the sound is overall quite warm and rich. Of course, a bit of the bass power is lacking due to the missing subwoofer, but we were very taken by the sound of the loudspeakers. Asus could have granted a bit more volume, though: Even at maximum volume the audio output was still fairly quiet. A good tool for improving the sound quality even more is the included SRS Premium Sound, with which the sound quality can be tuned perfectly to the content you're currently listening to with an equalizer and various sound pre-settings. 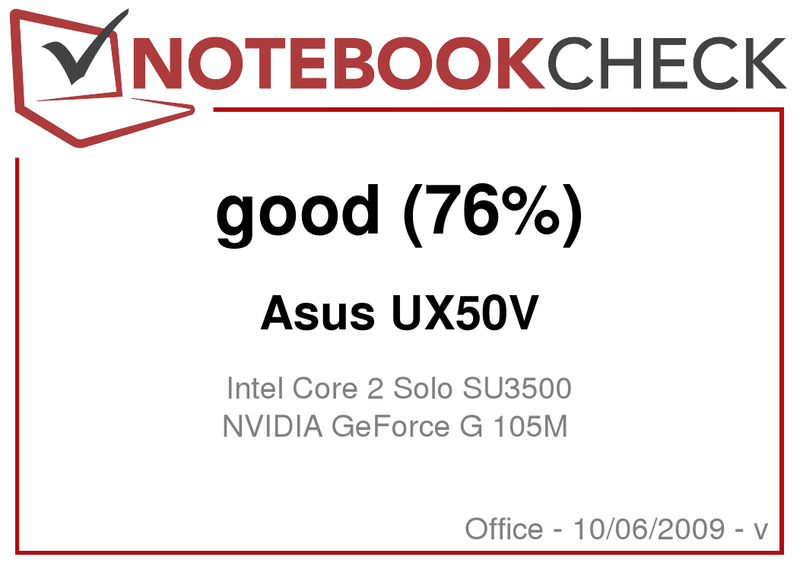 After temperature and system noise, this should be the third category in which the notebook can score in. Unfortunately, the emphasis is on "should": The battery lasts 4 hours and 45 minutes at minimum load. It's alright but by far not a top value. The fairly large screen and the small 4 cell battery with 42 Wh probably take their toll here. By the way, minimum load means the following by us: the BatteryEater Pro reads its way through a simple text document, while WLAN and Bluetooth, as well as the keyboard light are deactivated. Additionally, the display brightness is reduced to a minimum and it has been switched to the energy saving graphic card - that is maximum energy saving options. 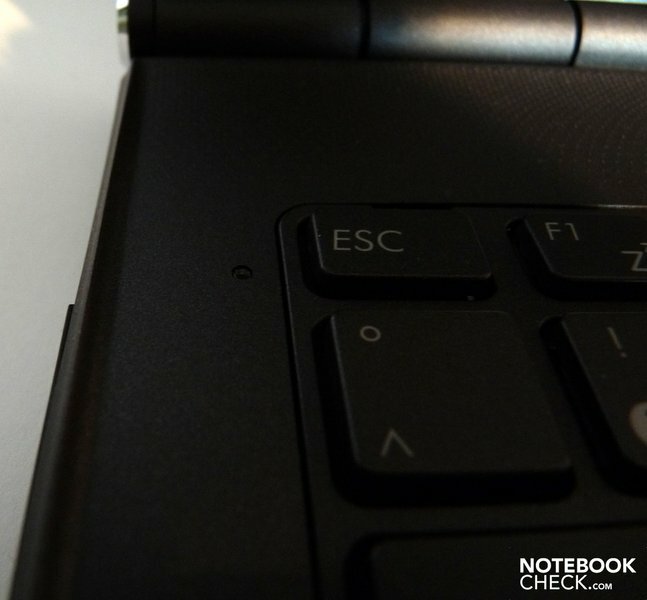 Under full load, hence with maximum display brightness and keyboard light, as well as activated WLAN and the BatteryEater's Classic test, the notebook reaches pretty much exactly a battery runtime of 1.5 hours. As both tests aren't very true to life but rather state possible extreme results, we tested the battery life at WLAN surfing and DVD rendering, too. We achieved a reasonable runtime of 2.5 hours at WLAN surfing. For DVD rendering it sufficed for 115 minutes, that is short of 2 hours. As long as the battery is new, a movie on the go should be possible. The battery life was overall disappointing, especially in view of the energy saving processor that Asus has built into the UX50V. "If low performance, then at least a high battery life", we'd like to shout at the manufacturer. It is exemplary that Asus' energy saving mechanisms not only include switching to another graphic card but also that, for instance, the Windows sidebar and other programs that aren't vital are deactivated automatically in the energy savings mode. The success of these measures is, however, obviously kept within limits. The UX50V, in the configuration tested by us, sits a bit on the fence: On the one side it's slim, has many energy saving components, and stays quiet and cool. In short: It could be a very good notebook for on the go. However, the merely mediocre battery capacity, the reflective screen and the sensitive materials oppose this. In order to make a start into the multimedia category, the built-in Core 2 Solo U3500 processor simply doesn't have enough performance, especially if several tasks at once are to be managed. 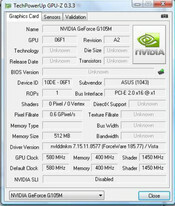 Therefore, the Geforce G105M can also only achieve weak performance in all benchmarks. Ideally, the notebook can be used for watching a DVD on an approx. two hour train trip, then a bit of word processing in the office and afterwards maybe running an older game classic in the drive. Who doesn't expect more from a notebook will be served accordingly with a "good" in our rating. In any case, the people in the train will look twice at the attractive design and the keyboard light will be helpful in a tunnel. In the office, you type on a large and pleasant keyboard and easily store all important documents on the big and fast hard disk. The classic game is then played with very good, even if quiet, sound from the Altec Lansing loudspeakers. However, you should flout the weak screen, the unusual port positioning and the extremely smudge susceptible surfaces - not to forget the glossy display. It's only left to hope that Asus will bring the dual-core processors to Germany or that Windows 7 unloads the single-core processor a bit. Because working with the UX50V isn't by far as fun as the design promises. A webcam and microphone are built in over the display. Keyboard and display brightness can be adjusted optionally via a brightness sensor. The brightness sensor can be activated with the key combination "Fn + A"
... can also be adjusted and deactivated over function keys. ... or for switching to an external monitor. 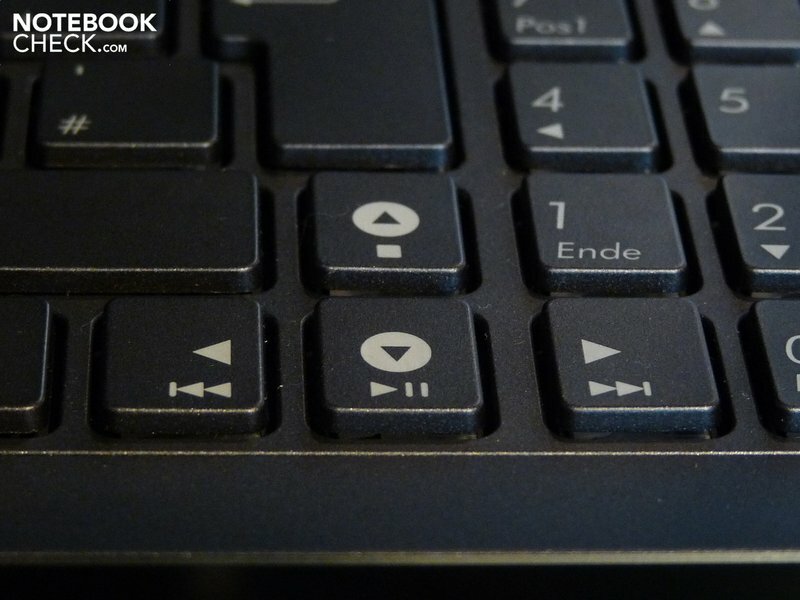 The notebook shows chic animations on the screen when the function keys are used. Here, volume control and WLAN activation. 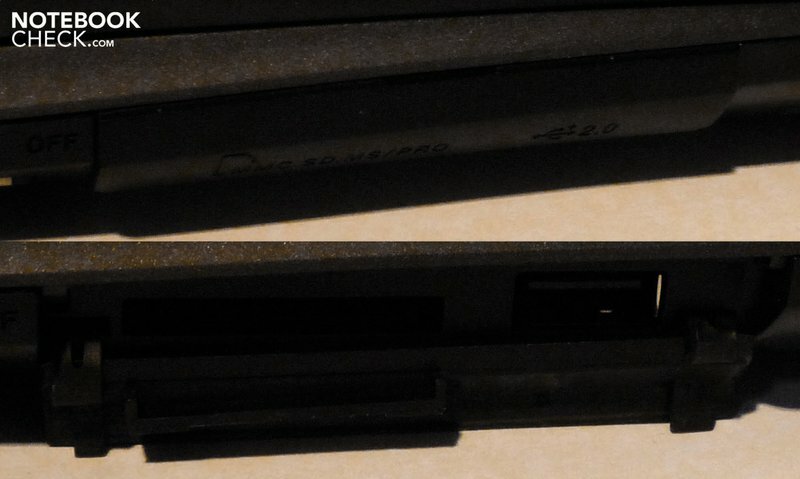 A slot-in DVD drive is built-in on the right. You have to get used to the noise made at pulling in of the DVD, though. The cardreader and a further USB connection are found behind a flap on the left. The loudspeakers come from Altec Lansing and have a good but somewhat quiet sound. ... and also has a numerical block. ... and reflections are included in the Asus UX50V. ... as, unfortunately, the screen does, too. Matt materials have only been selected for the keyboard. 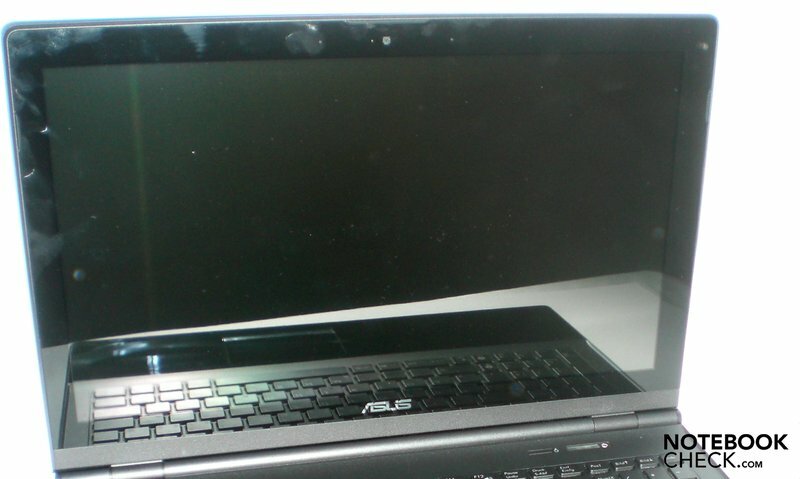 At least Asus includes a microfiber cloth for cleaning. The side line is also nicely designed. ... just like the power button. The positioning is a bit awkward, though: Underneath the front edge, but at least under an elegant metal grill. A matt display and more performance. That low performance and low battery life turn up together. 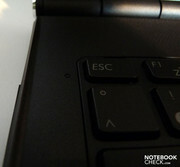 The Samsung Q320 doesn't only bid all fingerprint-haters a matt surface but also a dual-core CPU. The previously tested Lenovo G550 also offers a two-core processor for a lot less money and is also available with the Geforce G105M. Otherwise Aspire Timeline models from Acer.